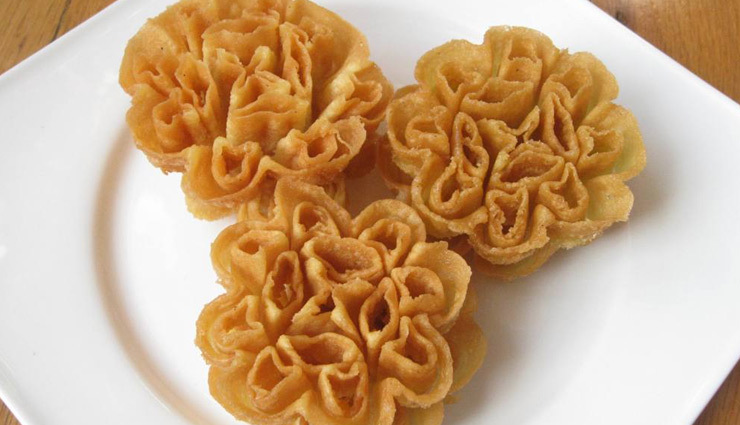 Rose cooky is a famous South Indian snack made during festivals. It is known as Achu Murukku in Tamil and Malayalam and Gulabi Puvullu in Telugu. It has a very pretty flower shape. * Apply oil on the achu murukku mould and let it rest for one or two days. This will help in making the murukkus easily. * I usually take all the above ingredients in the biggest jar or the mixie or a blender and blend for few minutes to get a smooth thick batter. You can also mix with just a ladle or hand mixer. * Heat oil in a wide kadai. Leave the murukku mould inside the oil. Only if it hot enough, the batter will stick to it. * When the mould has become hot, dip it carefully inside the batter such that only 80% of the mould is covered with batter. This is important so that the murukku easily comes off the mould. * Gently hold the mould inside the hot oil. You will see the oil bubbling. * After few seconds, shake the mould handle gently to release the achu murukku into the oil. You can also use a fork to help release the murukku. * Let it fry in medium heat till the bubbling of the oil subsides. * Turn the murukkus half way so that both sides have an even golden brown color. * In the meantime, leave the mould in the hot oil so that it is ready for the next murukku.